Anything that is applied to the face as a stay-on product should first and foremost have a pleasing and inviting scent to the person using it (ideally also to the person they are intimate with). The first thing we humans do when we are presented with a cream or any other skin care product is sniff it. If we find the scent unappealing, we instinctively put it back. Like it or not, we are all guided by our noses. Creating the perfect skin tonic scent is just as important as making the product do what it is supposed to do for the skin. I'm not talking about adding perfume – I'm talking about combining natural ingredients to achieve an appealing, harmonious whole. Happily, there are almost always several 'right answers' to be found. Regardless of skin type, it is possible to achieve the same (or nearly identical) effect with a number of different hydrosol combinations. And each mix will have a unique scent and feel. This past week I have been composing a personalized skin tonic for a new aquaintance. Above, a peek at how the initial test-batch looks. Hopefuly, one of these 2 combinations will be 'just right'. The samples shown are a Neroli (Orange Blossom) & Hamamelis (Witch Hazel) hydrosol mix and a Melissa (Lemon Balm) & Chamomille hydrosol mix. For this person, I also added some extra skin purifying extracts as well as a moisture-binding ingredient to extend the function of the tonic. 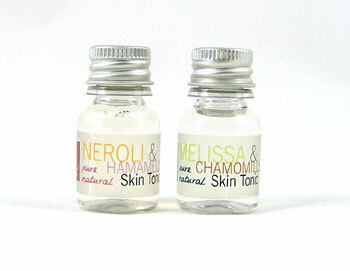 Both of these mixes are good for combination skin. There is enough in each sample (10 ml) to last a few days. I'm anxious to hear the feedback after this client has had a chance to try them.